As they did in North America, wolves once roamed much of Europe. And, as in North America, wolves have suffered at the hands of humans. But for much longer. By the early 1500s, for example, wolves had been hunted and trapped to extinction in England. Sweden placed a bounty on wolves in 1647. They were eradicated from Scotland by the late 1600s and from Ireland and Denmark by the late 1700s. The recovery of wolves in Europe began in the mid-1900s. Within thirty years, small and isolated wolf populations expanded as the human population declined in some rural parts of the continent and natural prey increased. Still, many European wolves now subsist on livestock and garbage, though moose, red deer, roe deer, and wild boar are important food sources in the more mountainous regions of Eastern Europe. 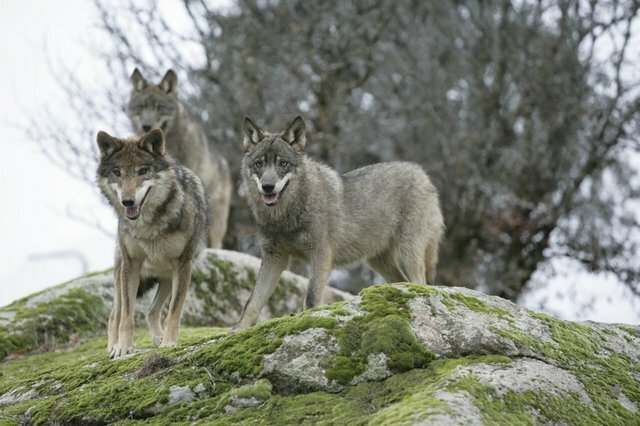 About 1,500 wolves, possibly Europe's largest wolf population. There is growing human pressure on habitat, wolf-rancher conflicts, legal hunting, and poaching. In 2013, a Spanish advocacy group, Lobo Marley, gathered 198,000 signatures on a petition calling for the protection of wolves. About 1,000 wolves. The wolf is nationally protected and as the wolf population has grown, farmers have illegally shot the animals and dumped their bodies in villages as a public reprisal for the death of livestock. Wildlife expert Franco Ferroni believes that Italy's hundreds of thousands of feral dogs - not wolves - may be behind many livestock deaths. About 30 wolves remaining. Sheep, government policy, and poaching threaten wolves' survival. Predator Alliance Norway reported in September of 2014 that the designated wolf zone - where wolves are allowed to breed - now includes only five percent of the country. About 24 wolves, possibly Europe's smallest wolf population. In January of 2014, Wolf Group Switzerland (Gruppe Wolf Schweiz) put up wanted posters offering $11,000 for clues that lead to the arrest of the poacher of one of the country's few wolves. From Spain to Switzerland, sides have been chosen by how one answers this question: Are you for livestock or wolves? That is the same question that divides Americans. And - as in the US - wolf advocates in Europe battle for these essential predators. The survival of wolves is an international challenge and as much a cultural issue as a biological one. Wolves do not recognize national borders; neither does wolf hatred. In Europe and Asia, the US and Canada, we must learn to coexist with - not kill - wolves. People who advocate for wolf survival can learn from and support each other regardless of the country they call home. For a detailed report on the current plight of wolves and the efforts being made to save them in Spain, Italy, Norway, and Switzerland, visit my blog. Rick Lamplugh is a wolf advocate and author of the bestselling In the Temple of Wolves. Available as eBook or paperback at Amazon. Or as a signed copy from the author.